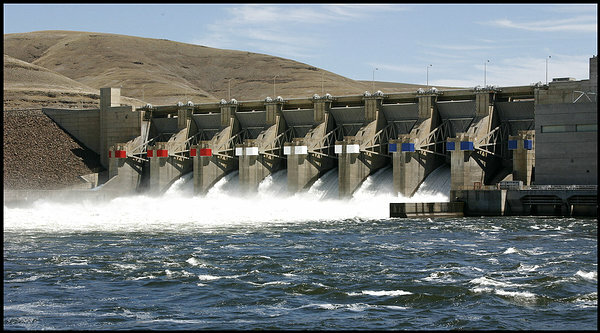 Portland U.S. District Judge Michael Simon has ordered increased spring spill from eight dams on the Columbia and Snake rivers in 2018 to improve survival of downstream-migrating salmonids. Plaintiffs originally requested that spill start as early as the beginning of April 2017, but Simon ruled that the government needed to spend the intervening time studying how best to release the water without creating conditions that could endanger fish further. This testing is to take place at the Engineer Research and Development Center in Vicksburg, Miss., which contains scale models of all eight dams. Dams affected by this ruling – all of which impound water for hydroelectric generation -- are 603-MW Ice Harbor, 810-MW Lower Monumental, 810-MW Little Goose, 810-MW Lower Granite, 1,242-MW Bonneville, 1,780-MW The Dalles, 2,160-MW John Day and 980- MW McNary. The U.S. Army Corps of Engineers operates all of these facilities. Plaintiffs also called for spill over the dams 24 hours a day during the spring juvenile migration, but Simon called instead for testing and development of spill patterns. Additionally, plaintiffs asked Simon to halt a planned $37 million in upgrades for the turbine runners and stator windings at the Ice Harbor project that would take place from 2017 through 2019, saying spending the money could bias the outcome of an environmental study, which is in its early stages. Simon denied this request, saying, "...the Court finds that the balance of harms and public interest weighs against the specific injunction being requested." Finally, Simon did not approve a ban on future "new capital improvement projects or expansion of existing projects at any of the four Lower Snake River dams" with a price tag of more than $1 million. However, he did say the plaintiffs would be notified of future projects. The plaintiffs in this case are the National Wildlife Federation et al. The federal defendants are listed at National Marine Fisheries Service et al. Intervenor-defendants include the State of Idaho, State of Montana, State of Washington, Kootenai Tribe of Idaho, Confederated Salish and Kootenai Tribes, Inland Ports and Navigation Group, Northwest RiverPartners, and Columbia Snake River Irrigators Association.